We have a beautiful fleet of clean, chauffeur driven vehicles, perfect for you and your loved ones transportation. Call us on 0121 434 4340 for more information. First of all our primary aim is to ensure that your loved one has a dignified final journey. While with its own personal touch. The hearse and funeral cortege could follow a special route, appropriate to your needs. The hearse will accommodate any flowers that you chose. Please contact us to discuss individual requirements. At A.B. 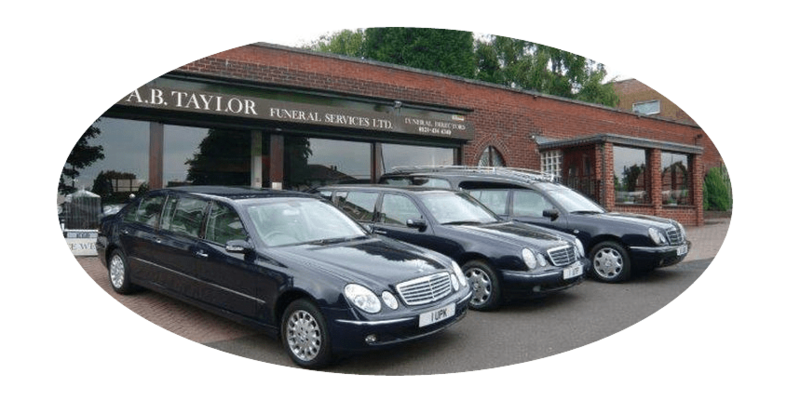 Taylor Funeral Services, we are proud to provide a beautiful fleet of vehicles. Including Rolls-Royce, Mercedes Hearses and Limousines for your loved ones final journey in the funeral cortege. Furthermore we treat each service and ceremony individually. While we have a wide range of funeral vehicles, other means of transport are available by arrangement. Saying goodbye is never easy. At A B Taylor we strive to offer you the best possible way to do so. Our dignified funerals, future planning and ceremonies come in a truly bespoke way. Some people choose to pay for their funeral in advance as it removes the financial burden from the family. Whilst also ensuring that there is enough money in place to cover the cost of the funeral. Pre-paid funerals are priced at today’s rate. So even if the costs go up in the future, the pre-paid funeral plan is honoured. Therefore wishes will be fulfilled at the set rate regardless of future inflation. It is important to remember that each funeral ceremony and service is unique. At A.B. Taylor we listen to your thoughts. First of all we guide you through what is necessary, what is legal and what is practical. Also what is in accordance with your beliefs and your personal requests and choices. We offer a wide range of coffins and caskets as well as funeral transport. A funeral tailored to your individual requirements. Each funeral service is personal and individual to your needs, it can be as traditional and personalised as you wish. We will help you plan the funeral at every stage and discuss options. As well as funeral services for all faiths and denominations, and ceremonies for those who do not have religious belief. Some people choose to pay for their funeral in advance as it removes the financial burden from the family. Whilst also ensuring that there is enough money in place to cover the cost of the funeral. Pre-paid funerals are priced at today’s rate. So even if the costs go up in the future, the pre-paid funeral plan is honoured. As a result wishes are fulfilled at the set rate regardless of future inflation.